How do I change my launch and end dates for my campaign? Update the launch and end dates for your upcoming campaign. You'll land on the "General Info" tab, which is where you'll update the dates. Scroll down and you will see the "Launch Date" and "End Date" options. Be sure to select "Save" when you're finished! 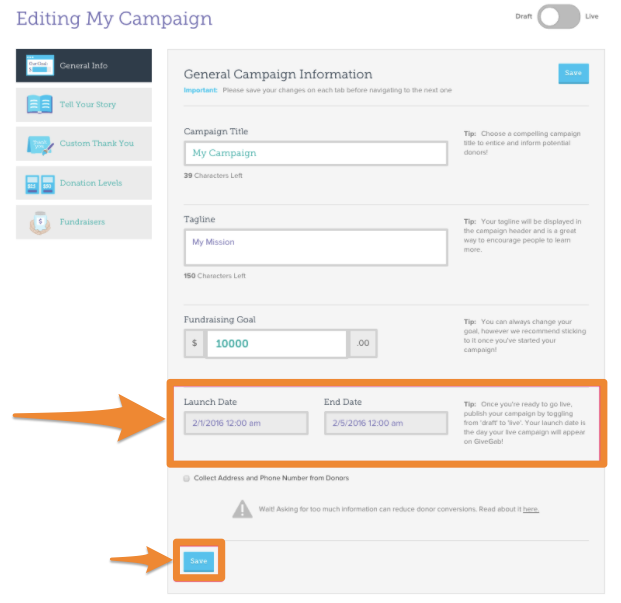 Note: If you're participating in a Giving Day, your campaign will show up on your Giving Day profile when your campaign is live and the current date falls within the launch and end dates you set here. Note: If you're looking to recreate a campaign you've previously run, follow the directions here to start a new campaign!